Home >> Listings >> Talbert Manufacturing Inc.
Talbert’s traveling axle (TA) trailer is designed for loading low profile equipment. Axles glide forward to allow the deck to tilt from 6 to 8 degrees for easy loading. 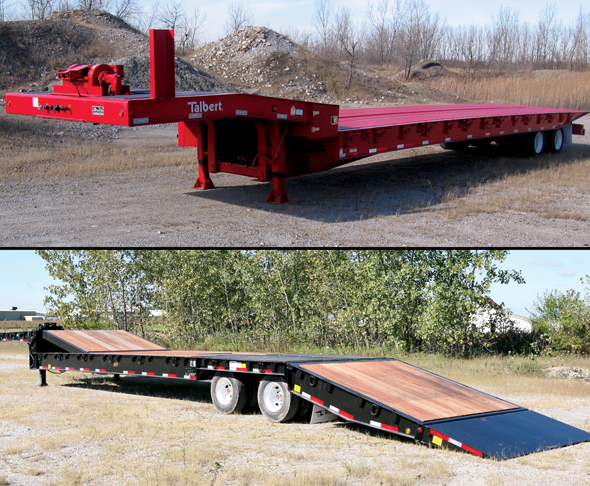 Talbert offers hydraulic folding tail (HT) trailers with a 15,000-lb. hydraulic wireless remote control winch, 17.5” tires and air ride suspensions. TA and HT models are available in tandem-axle, 35-ton capacity up to tri-axle, 55-ton capacity. Call 800-348-5232, email Sales@TalbertMfg.com or visit www.TalbertMfg.com.